Why Quilts Matter: History, Art & Politics is an exciting and thought-provoking nine-part documentary series that will change the way you think about quilts. Uncover the unsuspected size and depth of quilt culture. Delve into the inner workings of the art world, explore behind the scenes in the quilt marketplace, and journey into the complicated, kaleidoscopic world of quilts. Explore two centuries of history, watch as women gain power from their handiwork, and consider the nature of art itself. 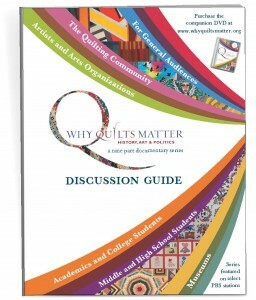 For an inside look at a highlight from each of the nine fascinating episodes of the documentary Why Quilts Matter: History, Art & Politics, please click on the episode listings below. Episode 4: What is Art? Episode 8: Quilt Nation – 20,000,000 and Counting! 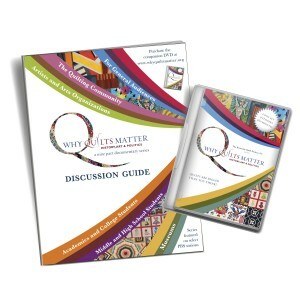 Click on the Add to Cart button below to purchase your own personal copy of Why Quilts Matter today! 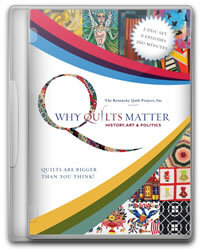 To purchase the Why Quilts Matter: History, Art & Politics DVD set with Public Performance License, please click here.